"How angry am I? You don't want to know." But we do want to know, and over the course of The Woman Upstairs, we find out just how angry Nora Eldridge is - but why? Nora is a single woman in her early 40s, who tells the story of a short period in her life a few years previously, during which she developed an overwhelming, obsessive attraction to the Shahid family: Reza, a charming little boy who enters the third-grade class Nora teaches, his Lebanese father Skandar, a renowned academic, and Sirena, a charismatic Italian artist seeking a co-tenant for a studio. Nora, whose own artistic endeavours were long ago thwarted partly by a lack of confidence and partly by time spent caring for her dying mother, is so captivated by Sirena's exotic, vivacious energy and charm that she agrees to share the studio rent as Sirena works on a large-scale installation influenced by Alice In Wonderland. Just as Sirena's art is expansive and extravagant, Nora's is contained and meticulous: a series of miniature, boxed reconstructions of rooms inhabited by doomed, iconic women from Virginia Woolf to Edie Sedgwick. Cleverly, Claire Messud makes a point of having Nora explain that it isn't the Shahids' family unit she is attracted to. She is obsessed with them all as individuals, equally physically attracted to Skandar and Sirena and desperately maternal and protective towards Reza, and consequently, her interactions with them all are tinged with an unsettling jealousy. Concealing so much from those around her - an attempt to seek advice from her friends Didi and Esther sees them essentially suggesting she pull herself together - Nora is painfully honest with the reader, and there were plenty of moments when I felt excruciatingly embarrassed for her. For all Sirena's effusive gratitude, Skandar's keenness to engage Nora in political and philosophical debate and Reza's easily-expressed affection, it's not hard for the reader to guess that Nora's importance to the Shahids is convenient and fleeting, and deep down, Nora appears to understand this too - which in a way, simply serves to accentuate the hopelessness of the situation. If there's anything that lets this book down it's the Shahids themselves, who never seem quite interesting enough to live up to Nora's fixation. Moreover, I can't quite buy into the idea of an intelligent, forward-thinking woman in her late 30s being quite as bowled over by their sheer foreignness as Nora seems to be. Skandar struck me as bordering on dull; the charisma that seems to overcome Nora from the first moment she meets him simply doesn't transfer from the page. I also failed to find the detail of Nora's art installation particularly convincing; it all seems a little too contrived, too whimsical, too close to cliche to be something that could ever take the art world by storm. 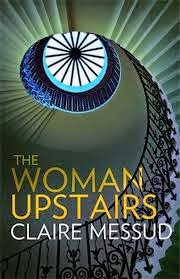 That said, The Woman Upstairs is a fascinating read with a wholly believable protagonist. It's a long way from being packed with incident - this is not a plot-driven novel and Messud's prose is often overtly 'literary', with no fear of the intricately constructed sentence - but never failed to hold my interest, not least because Nora's quiet disappointment over the loss of the Shahids from her everyday life simply doesn't seem enough to justify the bitter fury with which she opens the book. When we finally discover the straw that broke the camel's back, it comes as a genuine shock.